Whether your gathering is formal or informal, a varied offerings of gourmet cheeses as an appetizer with perfectly prepared fruit, wine or beer can help make the Sunday Dinner occasion something special. These are cheeses which do not undergo a maturing process and include Cottage, Cream and Ricotta. In taste they are the mildest, least flavoursome of all cheeses. They are usually not salted. Fresh curd is usually available for sale. These are sold in little packages either coloured of not coloured. Most people like curd as fresh as possible and at room temperature. They are a great snack and are used to make a very famous French Canadien dish available all over Quebec called Poutine. These cheeses have been heavily enriched with cream during their manufacturing process. The double cremes have a fat content of 60 per cent, and the triple cremes a 75 per cent fat content. This makes them all exceptionally rich, creamy and luscious. Some of them do not undergo a ripening process, so they can also be classed as unripened cheeses. Petit Suisse is a case in point. Although it is not ripened, its fat content can vary between 60 and 75 per cent. Other double and triple cremes are cured for about three weeks before marketing and develop a very thin, downy rind. These include Boursault, Brillat-Savarin and Excelsior. Others such as Blue Castello and Bavarian Blue have a blue veining. While double and triple cremes can vary in flavour and style, they have in common a degree of richness and creaminess not present in other cheeses. 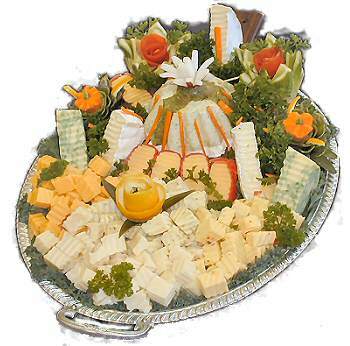 Into this category can be placed a great variety of essentially mild tasting, stable, all-purpose table cheeses. These cheeses are unpronounced in flavour and aroma which is not to say that they are without distinction. The range is considerable and includes the Samsoe group, Edam, Gouda, Bel Paese and Fontina. Such cheeses are usually firm and supple-textured, easily sliceable and make excellent lunch, breakfast or sandwich snacks. Many are of sufficient quality to be served at end of meals. The most famous of these is Emmentaler with its tough outer rind, distinctive holes or 'eyes' and characteristic mild, sweetish, nutty flavour. Relatives of Emmentaler include Appenzell, Gruyere, Royalp, Sbrinz and Raclette. Swiss-style cheeses usually have tough hard rinds and interiors dotted with holes. These holes are caused by expansion of gas within the cheese curd during the ripening period. Cheddar is one of the most popular and widely copied cheeses in the world. Cheeses that are 'cheddared' undergo a step in the making process which involves them being cut into pieces and stacked and turned at the bottom of the cheese vat for a period. The archetypal Cheddar cheese is firmtextured, yellow in colour with a clean, mellow taste which develops a sharp and tangy bite the further it matures. English cheeses such as Gloucester, Cheshire, Leicester, Lancashire, Derby, Wensleydale and Caerphilly all belong to the Cheddar family. Even Stilton, a blue vein, is Cheddar based. America, Australia, Canada and New Zealand all make varieties of Cheddar in varying degrees of strength. Vermont is one of the best-known American types and the Canadian Cheddars, made from unpasteurised milk, are highly rated. Cantal is a French Cheddar-style cheese and Kashkaval is a distant Greek relative made from sheep's milk. The majority of these cheeses are the Italian Grana style. They have an exceptionally hard, brittle texture which makes them suitable for grating and are known for their exquisitely sharp, piquant flavour. Cheeses of this type can be matured for up to three years. Parmesan is the best known of the group but the Swiss Sbrinz and Sapsago cheeses also fit into the category. Saanen, also Swiss, is sometimes matured for seven years. Young versions of some grating cheeses are used as table cheeses. Cheeses in this group are often linked historically in that they have monastic origins. Such cheeses as Port Salut, Saint Paulin, the various forms of Trappist cheese made throughout the world, Esrom and Havarti have similarities of taste, although varying degrees of strength of flavour and aroma. Several mountain cheeses, such as Beaumont and Reblochon, are also classified as monastery type cheeses. The majority of monastery cheeses are of the washed rind variety. These cheeses are characterized by their internal veining of blue, blue-black or green, and their pungent aromas and tangy flavours. All blue-vein cheeses are internally ripened after being inoculated with a Penicillium spore. They are usually classed as soft cheeses but can be crumbly in texture. Some, however, are exceptionally soft, even to the point of spreadability. Roquefort, Stilton and Gorgonzola are considered the three best blue veins in the world. These cheeses are known as bloomy or flowery-rind cheeses because of the light, downy white rind that grows on their surfaces, the result of their being treated with the Penioillium candidate spore. The interior paste of this sort of cheese is soft and straw yellow in colour. If the cheese is at its peak, the paste bulges out from beneath the rind when the cheese is cut. Tangy, richly delicate and delicious in flavour, Camembert and Brie are widely copied, but the French versions, of which there are many, are generally acknowledged as the best and the most full flavoured. Other cheeses of this type include Carre de l'Est, Coulommiers and Chaource. Distinctively different in taste to cow's milk cheeses, these cheeses come in a variety of shapes and sizes such as pyramids, cones and cylinders, all usually quite small. All have a characteristic barnyard or 'goaty' quality to their flavour, but whether this is mild or pronounced depends on how long the cheese has been aged. Some are quite delicate; others are ferociously pungent and rank. All French goat's milk cheeses are called Levees and today many are made from a mixture of goat's milk and cow's or sheep's milk. Like goat's milk cheeses, these cheeses taste quite different to cow's milk varieties. Their flavour ranges from mild to sharp. Some are noticeably salty, the result of being matured in brine. Many of the traditional Greek cheeses fall into this category, Feta being best known. Others, like Kashkaval and Kasseri, have a noticeable 'sheepy' flavour Qa sourish tang, distinctive and attractive and, like many goat's milk cheeses, vaguely 'barnyardy'. Many cheeses have their flavours enhanced by the addition of a variety of herbs and spices. Derby Sage has a greenish hue due to sage being introduced to the cheese curd during the making process (Vermont Sage is the American equivalent); Leyden is treated with caraway and cumin seeds; and Boursin, a triple-creme cheese, is marketed in flavoured versions ranging from pepper to garlic. Other cheeses may be studded with walnuts, covered with grape seeds or treated with cloves. The English are now producing several of their traditional lines flavoured with beer, wine, cider, port and chives. Smoked cheese is simply a cheese variety, often Cheddar or Emmentaler, which has been treated and flavoured with smoke. Most of this type of cheese is processed. It is often made in traditional sausage shapes. In most cases the smoke flavour is produced by chemicals rather than by hanging the cheeses over a fire. Smoked cheeses are often additionally flavoured with ingredients ranging from caraway seeds to a textured vegetable protein tasting like ham. While the great majority of cheeses are made from the curds of the milk, there are some which are made from the whey. Gjetost, a cheese totally distinctive in looks and taste, is one. It has milk sugar (lactose) and cream added to it during the making process and looks like a chunk of chocolate fudge. Ricotta, already classed as an unripened cheese, is also made from whey but is basically an Italian version of Cottage Cheese. It has nothing in common, in either taste or appearance, with Gjetost except that it is a whey cheese. Probably the best known cheese in this category is Limburger, Belgian in origin but often thought of as German due to its great popularity in that country. Cheeses that possess a truly powerful aroma are usually of the washed-rind variety. For many people the aroma is both the beginning and the end of the acquaintance. A legendary story about Limburger recounts the uproar that was created in a small town in Green County, Wisconsin, when a cartload of ripened Limburgers was left unattended in a main street. The fact is that cheeses such as Limburger, Maroilles and Livarot are extremely pungent smelling, not to say rank, and overpowering. In Limburger's case, its bark is somewhat less than its bite, for the cheese's taste is not as strong as its smell. Maroilles and Livarot, however, are both strong smelling and strong-tasting, as are the German matured varieties of sour curd cheeses such as Harz and Mainz (the American version of this style of cheese is known as Hand). Brick and Liederkranz, the two cheeses that are considered genuine American originals, are also noted for their distinctive aromas, but unless well aged they are not over pronounced in taste. All processed cheese has its ripening process arrested at a given point by heat treatment. It is usually made from one or two cheese types blended together and can never develop the individuality of flavour of natural cheese because the micro-organisms that create such things are effectively killed off. For many people processed cheeses taste 'plastic' and innocuous but nevertheless they are enormously popular partly because of their keeping properties, their economy and their blandness. Today there is an enormous range of processed cheese on the market, flavoured by a staggering variety of ingredients which range from salmon to pineapple.